Abstract: Introduce a "new" display technology like LCD and suddenly everything which is based on a Cathode Ray Tube (CRT) is old, obsolete, and totally uncool. Introduce a "new" display technology like LCD and suddenly everything which is based on a Cathode Ray Tube (CRT) is old, obsolete, and totally uncool. Normally I'd be the one saying that, but when it comes to CRT's there have been some very good improvements to the technology which are keeping it up to date with its' anorexic counterparts. For instance, "Flat Face" CRT monitors have evolved out of consumer's desire for a better viewing display with less image distortion at the outside corners of the tube. The technology has delivered on this desire fairly well, though there are a multitude of variations on this highly marketable trait. The three basic variations of a flat face CRT display are all flat on the outside part of the screen you see, but on the inside face of the screen glass things are different. LG's Flatron have a completely flat piece of glass inside and out, but other manufacturers use inside surfaces which are either curved in both directions like a traditional CRT, or are flat in one axis, and curved in the other. At first glance the flat faced Viewsonic P95f+B appears to have a totally flat inside surface, but with the help of the Light Test we find there is indeed a slight horizontal curve to the inside surface of the screen. We'll get to this in just a second, but first let's have a look at some to the traits which continue to make this professional grade CRT so appealing. The Viewsonic P95f+B is a 19" CRT based around a "PerfectFlat" aperture grille mask screen. The display features a 0.25mm dot pitch at the center of the screen, and 0.27mm dot pitch towards the corners. Optimal resolution is 1600x1200 @ 87Hz, but the screen will go as high as 2048x1536 if you are lucky enough to use a videocard which will support that resolution. Typically drawing 95W of power, the screen weighs in at 52lbs, and measures roughly one and half feet cubed. Viewsonic support P95f+B with a three year warranty, and it retails for about $320USD ($490CDN) on places such as Dealtime. We talked about flat face CRT displays a little bit already, and with the help of the "Light Test" you can determine for yourself just how flat one of these types of monitors really is. If you look at the images to the right, you can see what are two full CRT screens compared side by side with a light reflecting off the screen. Each of the photos was taken in a darkened room a few feet away from the monitors. The small white LED light was directed at the upper left corner of each screen, and as you can see, the number of reflections weren't exactly the same. 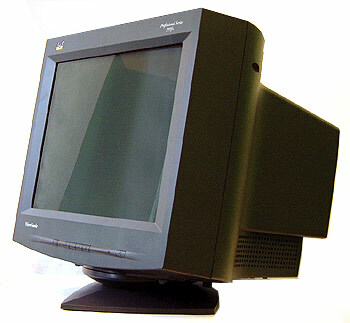 The standard tube CRT monitor is made by ADI Microscan, and in that image the reflected light is one large blurry area - light is not separated because the inner and outer surfaces of the glass are parallel, but remember this is a standard curved screen. The flat face monitor screen on the right is the Viewsonic P95f+B, and the red intersecting lines converge on the actual surface reflection of the white LED. 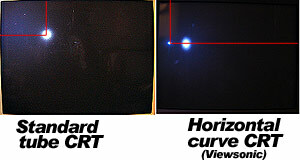 The second large blurry reflection to the right is the white light reflecting off of the inner screen surface, which is slightly curved in the horizontal plane. From this, we can conclude that while the outer surface of the display is indeed flat, the inner surface curves slightly in the horizontal axis. For the sake of argument, if the inner surface of the screen had curved in both the horizontal and vertical axis the blurry reflection would have been slightly lower than the actual surface reflection, which is sharp. In the next example, we've taken three photos of the Viewsonic monitor with light at different positions along the width of the screen to illustrate the point more clearly. As you can see, at the left hand side of the screen the inner reflection (blurry spot) is sightly to the right of the surface reflection which is sharp. At the center of the Viewsonic P95f+B display both reflections are superimposed over each other because the inner and outer surfaces of glass are parallel (this also helps explain why the screen is just a bit sharper at the center). Lastly, the far right image shows the blurry inner reflection just to the left of the surface reflection as the internal curvature continues. Since the light test was done at the bottom of the screen, any vertical curvature would have brought the blurry reflections up slightly, but that isn't the case so we know the screen only curves in one axis.